The Fujifilm Finepix F31fd is the successor to the popular Finepix F30 model, retaining its manual controls in the form of aperture-priority and shutter-priority modes, whilst adding Face Detection, a new technology that automatically enables it to identify up to 10 faces in a frame, optimize settings and capture an image within just 0.05 seconds. At first glance the Fujifilm F31fd is a pretty ordinary compact digital camera; 6 megapixels, 3x optical zoom lens, 2.5 inch LCD screen, all in a conventional metal body. Take another look at the specifications, though, and you'll find out why the Fujifilm Finepix F31fd is worth a second look. It offers a fastest ISO speed of 3200 at full resolution, allowing you take more natural photos in low-light conditions without having to resort to flash. Many other digicams struggle to offer a usable ISO 400 setting. The Fujifilm F31fd is currently sold alongside the F30, so which one should you choose? Read the rest of our review to find out. The Fujifilm Finepix F31fd is a compact digital camera that fits into both the palm of your hand and a trouser pocket. With dimensions of 92.7 (W) x 27.8 (D) x 56.7 (H) mm and weighing only 155g, this is a camera that you can slip into a pocket or small bag and not notice until you need to use it. During the course of this review, I carried the Fujifilm Finepix F31fd with me virtually all of the time, resulting in photos that I otherwise might not have taken at all. Fujifilm have made a couple of subtle improvements to the F31fd, with the camera having a larger, more protruding handgrip on the front than its predecessor, the Finepix F30, and the addition of an infra-red port on the side. Otherwise the external design is unchanged. The Fujifilm Finepix F31fd is just as pleasing on the eye as the F30, with a stylish two-tone silver/champagne colour scheme and a rounded, compact appearance. It also retains the excellent overall finish of the Fujifilm Finepix F30, and generally looks and feels more expensive than it actually is. The Fujifilm Finepix F31fd is fairly comfortable to hold, largely thanks to the dimpled area underneath the zoom switch where your right thumb is naturally positioned. Your right forefinger is then free to operate the shutter button, whilst your thumb controls the zoom. You can also comfortably hold the camera and take pictures with one hand. Despite the smooth all-plastic body, the camera is not too slippy when gripping it. The various buttons are well-made and easy to operate, and the camera feels well-balanced in your hands. Fujifilm have retained the F30's dedicated Exposure button, now combining it with the Face Detection function, and thankfully also kept the DC In port which allows you to recharge the F31fd without the use of a terminal adapter (which the older F11 used). There are no real innovative features here, but everything that the Fujifilm Finepix F31fd does, it does well. Overall the Fujifilm Finepix F31fd is well constructed and designed with no obvious signs of corners being cut. The Fujifilm Finepix F31fd has relatively few external controls, just 10 in total, which is surprising considering that this camera offers nearly a full range of photographic controls. You can directly access the various flash, macro, self-timer and delete options by clicking on the four buttons around the navigation pad. 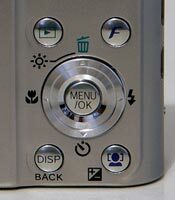 As with most other Fujfilm digital cameras, the Fujifilm FinePix F31fd has a Menu button on the rear of the camera which, as you would expect, gives you access to the software menu system. This lets you set various parameters including shooting mode (aperture-priority or shutter-priority), white balance, continuous mode and so on. There is also a small silver button with an F on it, which opens what Fujifilm call the Photo Mode menu. This allows you to control the file quality setting, ISO speed and colour settings (B&W, Chrome or Standard). I'm not really sure why these 3 settings alone should fall under the heading of Photo Mode, and things like white balance are just part of the standard menu. And I'm undecided about whether it is a good idea or not. The F button does give quick access to certain features, but you do have to memorise what another button does. As mentioned above, the F31fd gains an Exposure button, which allows you to access either shutter-speed priority or aperture-priority (depending on which mode you have selected in the main menu) and exposure compensation. Simply press the Exposure button and then press left/right on the navigation pad to alter the shutter speed or aperture, and up and down to set the exposure compensation level. This is a great improvement on the F11, where you had to set the exposure compensation via the main menu. There is, however, an annoying by-product of this system. Pressing the Exposure button effectively changes the default behaviour of the navigation pad buttons, and you have to press the same button again to change them back. I found that I would often forget which mode the camera was operating in and press, for example, the left button to change the aperture, only to set the Macro mode by mistake, and vice versa. I would have preferred a system where pressing the Exposure button would allow you to change the exposure settings, but then the navigation buttons would revert back to their default settings after a certain period of time, so that you knew that you then had to press the Exposure button again in order to change the exposure. Also, Fujifilm have decided to add the Face Detection function to the Exposure button, which is confusing at first but actually make sense when you discover that Face Detection only actually works in the Auto, Anti-blur or Scene modes. That's right, Face Detection is not available in the shutter-speed priority, aperture-priority or manual modes, presumably because Fujifilm think that more advanced photographers won't need it. On the more complex Finepix S6500fd model, however, Face Detection is available in all modes, so I can only assume that Fujfilm limited its availability on the F31fd because they didn't want to re-design the camera body to accomodate an extra button dedicated to Face Detection. Which is something of a disappointment, as this new feature is a welcome one that works quite well in the right situations. It's best for posed group shots where your subject(s) is standing still at a moderate distance, as the system is fooled if the subject is too far away, is moving quickly or has their head turned sideways. The manual amusingly says that it will also fail if the subject is standing on their head! Fujifilm's new innovation is a lot faster than other face detection systems that I have used, although it shares similar limitations to its competitors. There is a dial that on top of the camera that you turn to select the various shooting modes (Movie, A/S, M, Auto and Natural Light/Scene modes and Anti-blur). It's quite similar to the system used on many DSLRs and allows quick access to the various camera modes. All 10 external controls are clearly labeled using industry-standard symbols and terminology. Overall the camera body feels very well-designed and not at all cluttered, despite the presence of the large 2.5 inch LCD screen. Note that there is no optical viewfinder on the Finepix F31fd, leading to a few moments of frustration in very bright sunlight when it can be difficult to see the image on the monitor clearly. The F31fd's LCD monitor has a matt finish, compared to the glossy one on the F11, and it is also slightly recessed, which should lead to fewer scratches. The resolution of 230,000 pixels and 100% scene coverage are also very welcome. If you have never used a digital camera before, or you're upgrading from a more basic model, reading the comprehensive and fairly easy-to-follow manual before you start is a good idea. Thankfully Fujifilm have bucked the recent trend of not providing hard-copy manuals and decided to supply it in printed format. The main menu system on the Fujifilm Finepix F31fd is straight-forward to use and is accessed by pressing the Menu/OK button in the middle of the navigation pad. There is a single Shooting menu with 6 options. At the bottom is the Setup option - select this to access 3 more tabbed pages (each with 6 options) which contain options that you will probably set once and then forget about. Due to the large LCD screen, the various options and icons are perfectly easy to read. The F31fd has a few interesting features up its sleeve. The Anti-blur mode forces the camera to select a fast shutter speed in order to freeze subject movement more effectively, whilst alo setting a fast ISO speed and firing the flash (the Natural Light scene mode doesn't fire the flash). It's an effective automatic way of taking photos of children indoors, for example. Intelligent Flash is a little more exciting. This feature is actually a new scene mode called Natural Light and Flash (obviously the marketing department didn't talk to the engineers about the naming convention). When selected, the camera instantly takes 2 photos, one with flash, one without, giving you the option of which one to choose later (both are saved by the camera). The new infra-red port allows you to send or receive images (but not movies) to another Fujifilm camera or device with high-speed IR capability. Transmission distance is 5-20cm within a 20 degree angle. Note that the camera will compress the image so that it doesn't take too long to transmit. The Fujifilm Finepix F31fd offers a range of advanced exposure modes, including shutter-priority, aperture-priority and manual, perfect for the photographer who wants to take full control. The manual mode is actually misleading, however, in that it does not allow you to set both the aperture and shutter speed at the same time. Instead, the camera actually sets the aperture/shutter speed, whilst you can change all of the other settings (white balance, exposure compensation and so on). If you buy the Fujifilm Finepix F31fd because you think it has a proper manual exposure mode, then you will be sorely disappointed. There are some other notable missing features that will disappoint the photographer in you, and which I think Fujifilm should really have added to the Finepix F31fd. Firstly there is no manual focus mode, which is fine for most of the time as the camera's auto-focus usually locks onto your intended target, but is an annoying omission on the occasions when it struggles (usually in low-light). An infinity mode for landscapes would have been a good idea, but this is also missing. Somewhat amazingly, Fujifilm have not included a histogram, either in shooting mode or image playback. Most if not all of their recent advanced cameras have this important feature, so it's pretty unforgivable not to include it on a camera that is aimed at the serious photographer. Finally there is no RAW mode, which may or may not be a deal-breaker for you. The start-up time from turning the Fujifilm Finepix F31fd on to being ready to take a photo is very quick at around 0.75 second, and it takes about 1.5 seconds to zoom from the widest focal length to the longest, and back again. Focusing is very quick in good light and the camera achieves focus most of the time indoors or in low-light situations, helped by a powerful focus-assist lamp. The visibility and refresh rate of the 2.5 inch LCD screen are good, and the resolution is excellent. It takes about 2 seconds to store an image, allowing you to keep shooting as they are being recorded onto the memory card - there is no LCD blackout between each image. In Continuous mode the camera takes 2.2 frames per second at the highest image quality, which is fairly quick for this class of camera, although this is limited to only 3 frames. There is a mode that allows you to take 40 frames at 1.5 sec. intervals, but only at the 6M Normal picture quality level. All in all the Fujifilm Finepix F31fd is quite fast in terms of operational speed. Once you have captured a photo, the Fujifilm Finepix F31fd has a good range of options when it comes to playing, reviewing and managing your images. You can scroll through the images that you have taken, view thumbnails, zoom in and out, sort images by date, view slideshows with lots of different settings, delete, protect, trim and rotate an image. You can also add a sound clip to an image, set the print order and the transfer order. The Display button toggles detailed settings information about each picture on and off, such as the ISO rating and aperture/shutter speed. As noted above, there is no histogram. In summary the Fujifilm Finepix F31fd is a compact, well built and easy to use digital camera that offers a lot of creative control, but which also (still) has some annoying omissions in its feature set. PhotographyBLOG is a member of the DIWA organisation. Our test results for the Fujifilm Finepix F31fd have been submitted to DIWA for comparison with test results for different samples of the same camera model supplied by other DIWA member sites.